...the large majority of us with a TBI look “normal” like me. Brain injury is an invisible injury. It is an invisible disability. Will Smith’s movie "Concussion" is sparking a lot of conversation about brain injury and the National Football League. Former fashion model and publicist Karen "Kay" Stephens has joined in the conversation to promote awareness of the silent epidemic of traumatic brain injury in a touching one-minute video released on her YouTube Channel Model Behavior with Kay Stephens, "The Face of TBI". Stephens’s simple, but powerful video showcases an attractive woman with placards highlighting the hundreds of therapy and rehabilitation totaling over 1,300 in her recovery. “We stopped counting the number of medical appointments at the end of 2012,” she says. It was in the fall semester of her final year at CUNY Queens College that she was struck in the head by a falling metal pole. The pole was part of a fencing surrounding Razran Hall, which was under repair. Stephens was completing a teaching degree while doing self-empowerment workshops, grooming and modeling summer camps, and publicity. That was 12 years ago. Stephens suffered a concussion also known as a Mild Traumatic Brain Injury. Some experts define concussion as a head injury with temporary loss of brain function, which can cause cognition, physical and emotional symptoms. “There is nothing “mild” about a TBI,” emphasizes Stephens. She went undiagnosed for almost five years struggling with cognitive impairments, emotional deregulation, vision problems, hearing and balance issues, urinary urgency and frequency, lost her sense of smell for three years, injured her cervical spine and later discovered that in addition to the muscle spasms that was affecting her neck and shoulder causing chronic pain, she had also broken her right shoulder with torn tendons and rotator cuff tear and injured her right hip and pelvis. “I must have broken my fall with my right arm,” she says. “The apartment looked like a war zone with Post-its everywhere,” added her daughter LiLi Stephens-Henry who is pursuing acting and spends her time between Los Angeles and New York. “I didn’t know what to do. I was just in my first year of high school when this happened. I felt scared and helpless,” she finished. TBI is the leading cause of death and disability and seizures worldwide. Every 23 seconds, a person in the United States sustains a brain injury. It is a serious epidemic currently leaving an estimated 5.3 million Americans with disabilities. In the European Union, brain injury accounts for one million hospital admissions per year. While in Australia and Canada an estimated 700,000 and 500,000 persons are living with the disability. TBI does not always include an open head wound, skull fracture or loss of consciousness. Many TBI survivors like Stephens rely on state-funded programs like the Medicaid TBI Waiver Program for home care, independent living and other services. The waiver program utilizes a service coordinator to coordinate the care of the TBI participant, and the plan is vetted by a Regional Resource Development Agency. The NYS Department of Health oversees the program. TBI participants also receive housing subsidies in order to remain in their homes and to help them transition from nursing home into the community. “I hear talks that the housing subsidy is in jeopardy,” says Stephens concerned. She is referring to plans being contemplated by state legislators to create a managed care for the waiver program. The Brain Injury Association of NYS BIANYS is advocating for a "carve out" of the TBI and the Nursing Home Transition and Diversion Waiver to Managed Care. Many TBI survivors and families struggle financially because of the long and extensive rehabilitative treatments required for recovery. And, although some are able to financially care from trusts received from personal injury lawsuits, some are not so fortunate. In Stephens’s personal injury case, although the jury awarded liability in January 2012, the case was dismissed in May 2013 on appeal by the insurance company. The Appellate Court ruled that she did not prove notice of the dangerous condition or that the contractor erected the fence. Kay Stephens is a Jamaican American former publicist and fashion model with PULSE Modeling Agency in Kingston, Jamaica and the International Marco Rasala Models Agency in London, England in the 1980s. 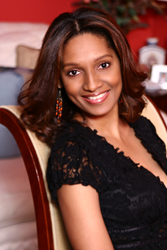 She has done commercial work for American Airlines and represented the “Always” brand in a Caribbean advertising campaign including work for Nichole Farhi/French Connection, Willi Wear Willi Smith, CHIC, TREND and BELLA magazines among others. Kay is a TBI survivor and advocate.